The UAE’s most populous emirate has become a global financial hub thanks to a diversified economy and tolerance of Western culture. Now Dubai is pushing a green agenda. The kingdom can learn much from its smaller neighbor, including its imperfections, as it tries to catch up. 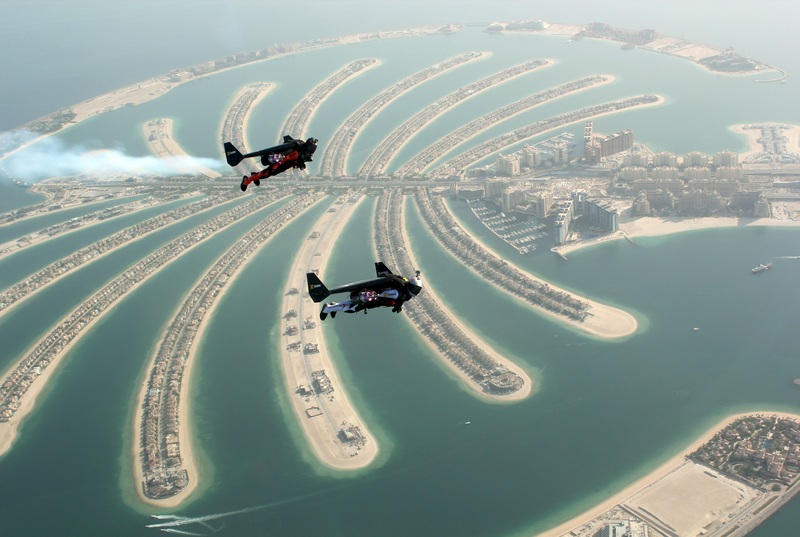 An aerial view taken from a sea plane shows Swiss pilot and original Jetman Yves Rossy (front) and Vince Reffett flying over Dubai's Palm Island, Dubai, United Arab Emirates May 12, 2015. Dubai Electricity and Water Authority hosted its fourth annual World Green Economy Summit in the emirate on Oct. 24 and 25th. During the conference, DEWA announced it had set up a 2.5 billion dirham ($680 million) green fund, part of a previously announced intention to raise 100 billion dirham.